To find the best toddler and big kid trampolines, we focused on safety, netting, durability, diameters, handlebars, reliability, fun, and of course, price! We first consider toddler trampolines, then big-kid trampolines. For details on what differentiates these, scroll down to the bottom of this page. Otherwise, here are the best trampolines we found! Here are the Best Little Kid Trampolines of 2019! #1 Toddler: Original Toy Co.
Trampolines are a great way for kids to get out some energy, and most kids will spend tons of time jumping on a new trampoline! They are great for outdoors during the summer, and indoors during the colder fall and winter months. Not only are they great fun, but physical and occupational therapists use trampolines to provide children with proprioceptive input, encourage rhythmic bouncing (which research suggests might help with language development), build strength, and get them engaged in a fun whole-body activity! Over the past few decades, several safety advances have made trampolines much safer than they used to be. For instance, new safety net placements and handle bar additions have reduced injury risk especially the smaller ones for toddlers and bigger kids aged 3-9. Of course, like any sport activity (bicycles, soccer, lacrosse, and the list goes on), there are always risks of injury, even with trampolines that seem very safe. Always supervise your kid on a trampoline, and never let more than one person use it at a time. For the Mayo Clinic's statement regarding trampoline use, including how to use trampolines safely, see here. 1. The Original Toy Company Trampoline. This trampoline has a cute blue/yellow/red color pattern and is basically tied for first place with the Bazoongi, you can't really go wrong with either of them. It folds up into a really compact footprint that can fit in a small closet or trunk, which is a big plus. Sometimes it's nice to put these things away for a month or two, then take back out for renewed interest! It has no metal springs, instead using a series of heavy duty elastic straps, which are excellent. While bungee cord attachments tend to break after 8-12 months of heavy use, these elastric straps have proven themselves far superior, lasting for several years. We also thought this was one of the easiest trampolines to unfold and set up in our test living room, and liked that it used 6 instead of 4 legs to increase stability and safety. It also felt very sturdy and well built. This 36" diameter trampoline also has the highest weight limit we could find, coming in at 150 pounds (!) so even mom might be able to have some fun! Now for the fun parts: it has a nice wide bouncing surface, has a great bouncy elastic to the trampoline itself while still being firm enough to prevent kids from jumping too high, and a padded upper handlebar. This trampoline ended up #1 on our list for four primary reasons: first, it uses the elastic straps rather than the unreliable bungee cord, second it has a very high weight limit, third because it feels very sturdy with its 6 leg design, and finally it is super easy to assemble (took about 10 minutes). The only downfall, like some others, is that once your kid gets heavier they might put more weight on the handlebar and make the back of the trampoline lift off the ground during jumping. While we highly doubt it would ever actually tip over, once your kid gets a bit bigger (60+ pounds) you might want to consider putting a little weight on the back legs (like a dumbell or bag of sand/rocks). 2. Bazoongi 48" Little Bounce Bouncer. Comes in purple, blue, or green colors. This is a great, reliable trampoline for toddlers with a very high (about 100 pounds according to the instructions) weight limit and very good-sized bouncing surface (4 feet wide). Though that doesn't mean adults should try jumping on one of them, for risk of tearing through the jumping surface or breaking a spring! This trampoline is #2 on our list because it uses springs rather than the heavy duty elastic straps to attach the jumping surface to the frame. Bungee cords tend to break after about 8-12 months of use, and while the straps seem to be the best, springs tend to better stand the test of time and hard use. However springs do pose a pinching hazard, and it can hurt quite a bit if a foot/leg falls down into the metal spring area, so keep that in mind. Overall, we found that it's well-made, sturdy, doesn't allow kids to bounce too high, and it has a nice padded handle - and the entire handle is padded rather than only the top like on most other units. The only downfall of this one is that we've noticed that once your toddler reaches about 30-40 pounds, and they are a hard jumper, the back of the trampoline can lift a bit off the ground during big jumping. We haven't seen any reports of it tipping over, but this of course can be concerning, and some parents have attached something heavy to the back of it to prevent it from lifting off the ground. 3. 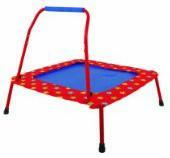 Little Tikes 36" Toddler Trampoline. 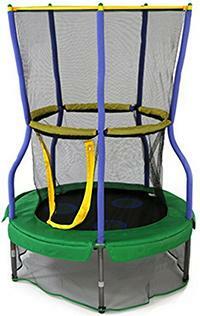 A cute, reliable, portable, sturdy and safe trampoline option for little kids. It uses a the same elastic strap type of material rather than springs or bungee, just like the Original Toy Company version, which is a safer and more reliable option. We found it very easy to assemble, with a firm bouncing surface that gets more flexible with time, and we loved the nice wide handle. The weight limit is relatively low on this option, topping out at 55 pounds, and the size of the bouncing surface is much smaller than the Bazoongi option. Cons? Well, we found some build quality issues worth considering. First, the foam on the handle tears/rips easily. Ours was shredded after the first day of use, and it's going to be much worse if your toddler likes to chew on anything mouth-level. Second, we found that the back will lift off the ground with more aggressive jumping. Not necessarily worse than the others, but worth pointing out. Finally, we also found that the blue fabric cover over the elastic straps sometimes popped off if kids bounced too close to the edgs. 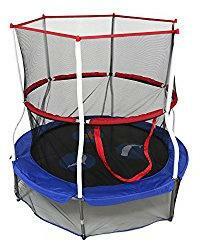 Overall, we think this is a great trampoline, and a very good option for a little first-time jumper. 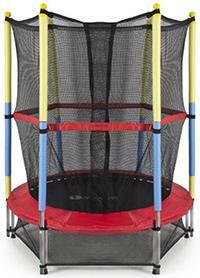 Coming in at the cheapest on our list, this is a good bang-for-the-buck trampoline for the little ones; but realize that toddlers will grow out of it pretty quickly given its small size, low jump profile, and low weight capacity. This is the most common choice of physical and occupational therapists, because it's relatively compact (about 2.5 feet wide square bouncing surface), sturdy, folds flat for storage, and kids can't jump too high on its relatively rigid bouncing surface. It's also fairly reliable, and the company is decently responsive when something happens. What will happen? Most likely, the bungee cord holding the jumping surface to the frame will break after about 8-12 months. This is not unique to the Galt, it also happens with other bungee-based trampolines (like the old One Step Ahead ones). That's why they sell replacement bungee cords online! Of course, we wouldn't suggest trying to replace the bungee cord yourself: we tried it and got so frustrated after a couple of hours that we completely gave up. Also, just like with the trampolines above, we found that it has a tendency for the rear legs to lift off the ground during aggressive jumping. 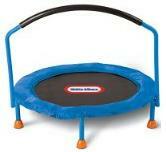 You will notice that it is somewhat plain looking, and smaller, but it's a good utilitarian trampoline option. Weight limit is 77 pounds. The bungee cord issue is the primary weakness of this trampoline, though it does come in at a good price point, usually about $50. Here are the Best Big Trampolines of 2019! For these reviews, we focus on trampolines well suited for kids over the age of about 5-6 years. For safety reasons, try to avoid letting kids under the age of 10 or so jump on a trampline surface larger than about 7-feet diameter, due to hazards associated with letting a little kid jump really high on those super-springy trampolines. And for safety, even the best trampolines need a parent or guardian nearby to attend to a child or teenager who's jumping! We also only review trampolines that have netting attached to the inside of the springs to prevent little legs from going down into the gaps between the springs. In general, the Skywalker and AirZone options tend to be the sturdiest and most reliable, though you might want to consider a bouncy house instead! 1. Skywalker 60" Adventure Trampoline. This trampoline comes in a couple different themes, with varied diameters: the seaside adventure is 60" diameter, and the zoo animal theme has a 48" diameter (and quite a bit lower price). We tested out the 60" seaside version, though we assume the 48" version is very similar. Skywalker is a great trampoline brand with a reputation for safety and reliability. This trampoline is no exception. It is suggested for kids aged 3 to 7, and has a 100 pound weight limit. One of the best things about this trampoline is that it has a padded 360-degree handle around the inside perimeter that kids can hold onto when they first start jumping and build their confidence. This unit uses a bungee cord rather than springs, so there's no pinch hazard - but bungees do tend to wear out and break a bit faster than metal springs. We must say, however, that we've had one of these in our back yard for a couple years how and it is still sturdy and hasn't had any bungee cord breakage. The white foam vertical bar pads have basically disintegrated and fallen off, and all colors have been bleached out from the sun, but it still works perfectly! Uses a fun zippered entrance, which is less annoying than the common Velcro ones. The only downfall is that it can be tricky to put together because the instructions that come with it are quite terrible, there are a ton of parts, and the assembly involves some tricky flexing to get the inside handlebars all attached. But once you figure that out, you'll be well on your way to years of fun! 2. Skywalker Jump N' Dunk Trampolines. This is the ultimate trampoline, for big jumping and big yards! Skywalker has a series of these "jump n' dunk" trampolines that starts as small as an 8-foot diameter, and goes as large as a 17-foot diameter. They have regular circular ones, oval ones, and even square and rectangular ones! All of them also come in a range of colors and patterns, like blue, green red and camouflage pattern. They are big, well made, and a bit expensive relative to others on this list (but cheap relative to fancier brands). But the safety features are there: the netting is positioned on the inside of the high quality heavy duty springs, the weight capacity ranges from 175 to 250 pounds depending on the size you choose, and we found the build quality to be overall high, with good welds and galvanized steel T-bars at critical support points. Entrance and exiting is through a dual-zippered slit (meaning you can unzip from inside or out) on the side, the vertical bars are foam padded and shaped with a curve to prevent bumping into them during jumping, and the outside edge padding is thick and UV protected to slow down fading in the sun. Note that as with most trampolines, the diameter is measured across the frame, so the jumping surface will always be smaller in diameter by about 2 feet. So an 8-foot trampoline is more like 6-foot diameter jumping surface, a 12-foot trampoline is more like a 10-foot jumping surface, and so on. In our testing, we used the 12-foot trampoline. It took us about 2 hours to fully assemble (with 2 people), with the help of an included spring-pull tool. The build quality was overall high, the jumping was awesome, and overall it seemed to be durable and well constructed. The velcro-on/off basketball hoop was a nice touch, though it wasn't really used much and we ended up just removing it. Over time, we expected the foam covers of the vertical bars to lose quality, the padding to fade in color, and the entrance/exit zipper to break. It has been about 8 months at the time of this writing, and the zipper hasn't broken and foam covers haven't broken apart yet. The pad has faded a bit in color, even with the UV protection aspect, but that's to be expected with anything you leave out in the bright summer sun. Overall, we highly recommend this trampoline, and expect it to last your family for several years. In general, we found the 12-foot diameter one to be most versatile: large enough to support growing kids, and a high enough weight capacity to support parents under 200 pounds. And that's half the fun here, that parents can bounce too! High recommended for a larger, outdoor-only, trampoline to support tons of fun for several years. 3. 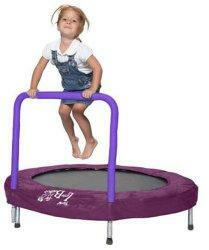 Skywalker 40" Lily Pad Trampoline. This is very similar to the 60" Seaside Adventure, but more ideal for smaller spaces. This uses a 40" diameter (meaning a ~30" jumping surface), which is pretty narrow for kids but definitely helps save a lot of space. All of the things we love about the 60" version are here: zippered entrance, interior perimeter handlebar, high quality and reliable constrution, strong netting material, and the netting is attached to the inside of the springs/bungee. Given its narrow 40" diameter, this configuration does make it feel a bit narrow inside, but it was perfect for our test kids ranging in age from 3 to 6. Our 7 year old gave it a shot and thought it was too constrained to enjoy. It does have a 100-pound weight capacity like the larger one, so it is feasible for smaller adults to have a little fun! The only thing we didn't like was assembly, much like with the larger version. Also worth noting that the vertical foam padding falls apart a bit if left outside, just like with the other one. Outside of that, you can get this for only about $55 online, and it should last for about 2-3 years until your toddler grows out of it around 5-6 years old. 4. Best Choice Products 55" Trampoline. This is one of only a big-kid trampolines over 48" wide that we know of using the netting-inside-the-springs configuration. The vast majority of trampolines over 48" wide use netting, but place it on the outside of the springs. For instance, the Little Tikes 7' trampoline is really awesome, but puts the netting on the outside of the springs. When we unboxed this trampoline, we have to admit that it was a real nightmare to put together. You need to attach the bungee cord yourself, which is a total pain and it always seems too short when you're trying to stretch it enough to attach where you're supposed to. The instructions were also pretty poor. But once we finally got it assembled, we were impressed with this trampoline overall, especially for the price. It has a good 55" circular jumping surface with good elasticity. The netting is thinner than the awesome Skywalker option (above), and there is no handlebar around the inside perimeter. Of course, this is also quite a bit less expensive than the 60" Skywalker, so those little luxuries aren't expected. Overall, a decent trampoline with the netting attached inside the springs (well, actually a bungee in this case), which we like. If you can afford the additional about $40, we definitely suggest going with the Skywalker. But if you're interested in saving some cash, definitely check out this option. 5. 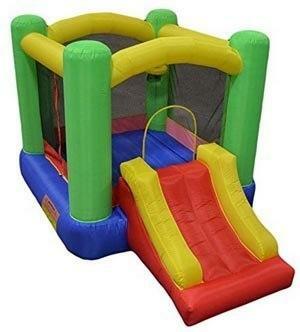 My Bouncer Castle Bounce House. Little Tikes 7' Trampoline. Excellent build quality, similar to the Skybound Super 7. Highly recommended, though we point out that the netting is attached outside of the springs, which we consider a safety hazard. And it does use springs, not a bungee or elastic. Skybound Super 7. 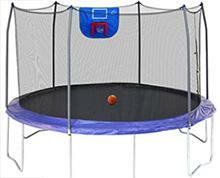 A great 7' trampoline with high reliability and build quality. However, the netting is attached outside of the springs, which we consider a bit of a safety hazard. My First Trampoline 84". Another great 7' trampoline option, very similar to the Skybound 7. Great price here, but again the netting is attached outside of the springs, which we consider to be a bit of a safety hazard. Upper Bounce Classic Trampoline and Enclosure Set. Yet another great 7' option, very similar to the Skybound Super 7. Though it does have the netting outside of the springs, we have to give them credit for the 3" thick padding they place over the springs to help reduce injuries related to a leg sticking into the spring area. More Details about the Types of Toddler and Big Kid Trampolines. The toddler trampolines usually are smaller, provide less of an elevated bounce, and have an attached handlebar with padding to ease kids into learning how to bounce on their own. These are very low to the ground (usually 4-6"), usually have a weight capacity under 80 pounds, and use either springs or bungee cords to hold the jumping surface onto the frame. Our boys have never fallen off one of these (knock on wood! ), even in the beginning, and they are not the most coordinated boys in the world! But they have succeeded in bouncing the trampoline into oblivion and breaking the bungee support cords, and we will talk about this issue when we review individual units. The toddler versions, because of their smaller size, are perfect for a play room, basement, or living room. Usually used indoors given their size, and just like one of the best play kitchens they are really a play room essential! The "big kid" trampoline includes safety netting (attached to the inside of the springs), a slightly larger and more elastic/bouncy jumping surface, and is a bit higher off the ground. These usually have a weight capacity between 100-120 pounds, and kids can jump quite a bit higher than on a toddler trampoline. They are a good option before stepping up to a larger and more dangerous trampoline that allows kids to bounce too high for their own good (and your and your insurance company's sanity). They are also still small enough to fit inside if you have a good space with high ceilings. As trampolines get larger than these (usually around a 7-foot diameter max), they are too big for in the house and are left outside all year round. Another note is that while your kid is using an outdoor trampoline, be sure to put on some kids mosquito repellent and sunscreen for kids, to keep things fun, safe, and comfortable!.